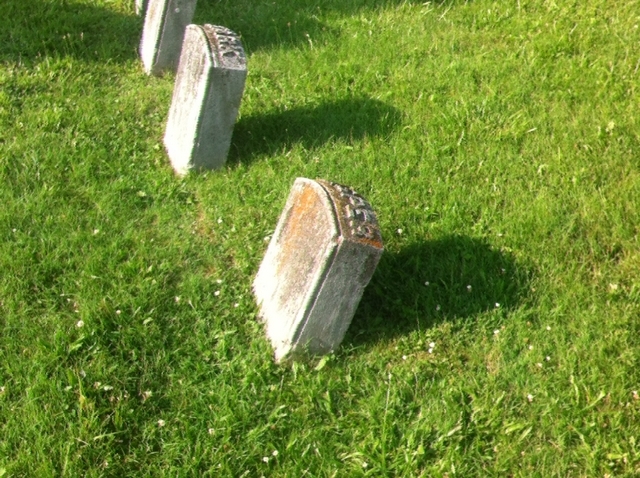 A small, simple stone marks the grave of Johnny Casper. He was an immigrant from Germany who came to the area to carve stone. It was reported that Johnny did not have enough money to bring his bride-to-be Katrina with him, so he began to save money in an old trunk for her passage. Two ladies who owned the boarding house across the street from where Johnny was staying talked him into moving in with them to save money. Soon he became ill. It was believed the two ladies were feeding him arsenic. When he died, the trunk full of money mysteriously disappeared and no one was convicted of the crime. It has also been reported that Johnny was paid to model for the large Stone Cutters Monument, located in the same lot as his grave. The Stone Cutters Monument was installed in 1894, one year after Johnny's death. According to Green Hill Cemetery records, Johnny Casper died from typhoid fever and was first to be buried in the Bedford Stone Cutters Association lot. The lot is owned by the Association and was purchased on the same day as Johnny's death.